The Anxiety-Free Child Program – Help Your Child With Anxiety Today – The Award Winning Anxiety-Free Child Program provides information and resources to help your child overcome their anxiety FAST. As Seen on TV! Don’t let your child’s anxiety continue to get in the way of the life they deserve. 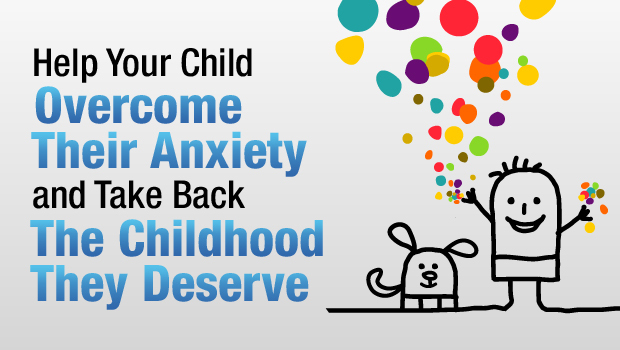 Learn how you can help your child BREAK the cycle of fear and take back the happy childhood they deserve! The Anxiety-Free Child Program is an award-winning and comprehensive system designed to quickly help your child overcome the anxious feelings that are holding them back from reaching their potential and show them how to be the secure, confident, and HAPPY kids they were meant to be! The Anxiety-Free Child Program combines information and resources for parents with tools designed specifically to be used by children so you can work together with your child to help them overcome their anxiety and quickly change their lives for the better. It’s an easy to follow and affordable system you use privately in your own home that teaches your child how to slow down their body, quiet their mind, and change their anxious and habitual thought patterns so they can respond with calm and confidence in situations that may currently be challenging for them at home, at school, with friends, or anywhere! The program was developed by integrating the research and advice of a team of carefully selected experts and professionals with the real world experiences of people just like you who have helped children that were struggling with anxiety or fear. It includes contributions from Doctors of Clinical Psychology, award-winning authors, licensed therapists, and others who can show you how to help your anxious child or adolescent live with far more confidence, inner security, and happiness by breaking through the self-defeating and limiting patterns of anxiety that may be holding them back. Stop by our blog and subscribe to get updates so you always have access to the best and most current information for successfully parenting children with anxiety. You’ll be able to learn more about how anxiety, stress, and fear effect both you and your child, read analysis of the medical and scientific research news that may impact the treatment of childhood anxiety disorders, and get a fresh perspective from inspiring and insightful editorial commentary written by doctors, child psychologists, parenting experts, university researchers, and people just like you who truly understand child anxiety. Sign up now to receive the completely FREE five part email series,“The Art of Raising Anxiety-Free Kids” that will help you better understand how your child’s anxiety and fear can become so powerful and seem to take over their life so quickly, what well intentioned parents often do to try and help their struggling children that they don’t realize can actually result in the anxiety becoming MORE SEVERE and difficult to conquer, the critical things to look at and consider when deciding between your available treatment options, and a lot more. Click the link below to sign up for the series and get started for free TODAY.